What are your favourite uses for baking soda? Did you know that there are well over 100 uses for Arm & Hammer baking soda? From removing smells from plastic containers and sweaty gym bags, to removing dirt and grime from no-wax and tile floors, this is truly a jack of all trades product. The How-to Crew wrote a great list of over 100 uses for baking soda on their website. I haven’t tried all of the ideas mentioned so I can’t confirm whether they work or if they are a miss, but they are worth checking out. You can’t go wrong by trying out some of these ideas, especially since baking soda is so affordable. 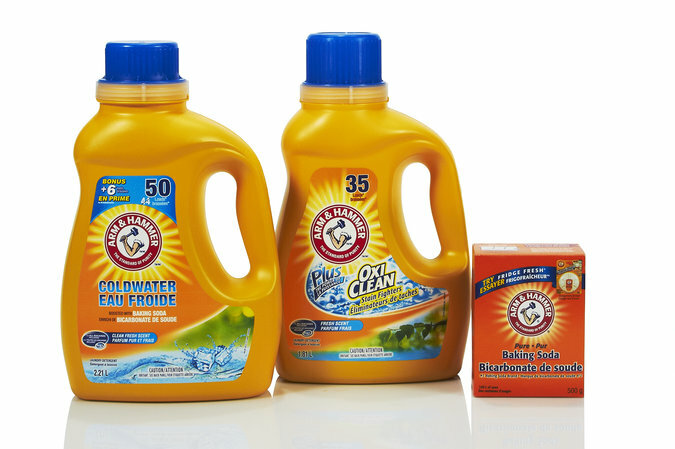 Arm & Hammer™ Cold Water Liquid Laundry Detergent will keep you smelling fresh and clean. It powers out dirt and odours in low temperatures with special agents in the detergent trapping soil in the wash water, so it rinses away and doesn’t redeposit on your clothes. Fight tough odours in your clothes with Arm & Hammer™ Plus OxiClean™ Laundry Detergent, Fresh Scent. This formula, with deodorizing Arm & Hammer™ Baking Soda, neutralizes even the toughest odours, while OxiClean™ Dirt Fighters loosen and help lift up dirt. So do you have any favourite uses for baking soda that are tried and tested? Share them in the comments below because we are always looking for ways to cut costs while still getting the best clean we can. Disclosure: This post is written as part of an ambassador program with Church & Dwight. Opinions are our own.